If It’s Magic, Why Can’t it Be Everlasting? Today’s post features a musician on tour right now that you may have heard of: Stevie Wonder. Not to be too dramatic here, but I think seeing Stevie Wonder in concert should be at the top of the bucket list for anyone who appreciates music and the powerful impact it can have on the world. There is little debate that Stevie will go down as one of the greatest musicians of all time…but it’s not just his gift for music that he’ll be remembered for; he’ll also (and perhaps moreso) be remembered for his heart. I had the pleasure of seeing him in concert. While he often deviated from the intense Songs in the Key of Life album that the tour is based on, his speeches about love, “hate no one,” justice and equality reverberated around the stadium, and I hope it continues to penetrate the world. In particular, he sang the below song – “If It’s Magic,” with the background harp played by Dorothy Ashby who died of cancer at the tender age of 55. Stevie Wonder is one of those artists that takes you into another place and another time when he sings. He has an incredible gift that cannot be duplicated. Cannot. stop. listening. to. this. song. It’s interesting to see the amount of streaming services coming to the market this year – particularly led by the support of the musicians themselves. Feels like it was just yesterday when artists were complaining about streaming / unlimited subscription fees, doesn’t it? The latest is Jay Z’s Tidal, announced a week ago with a splashy press conference involving some of today’s most popular musicians. In the coming months, Google will take its YouTube Music Key service out of beta and Apple will put on an ambitious relaunch of Beats Music. In an interview with Billboard, Jay Z made clear that Jimmy Iovine, the legendary record executive who now works with Apple, had been competing with Tidal for celebrity-musician endorsements. This might explain why big names like Taylor Swift and Drake didn’t join their friends Nicki Minaj and Madonna at last week’s press conference; it’s possible they’re aligned with Beats instead. So what do you do? Go for Taylor or Nicki? (Nicki clearly) …should consumers have to make a choice? My view is that there is a fundamental problem with artists shifting from one platform to another. Artists themselves are the product being sold (yes, artists are a product, a brand, an image defined by the work they create…) I’m all for giving artists power over their work, but it seems they are indirectly about to engage in a competition with one another. And in truth, I’m not down with doing an easter egg hunt to try to listen to my favorite ones. When artists lament Spotify’s meager payouts, the real culprit isn’t the streaming service, which pays out 70 percent of its revenue to labels and musicians—it’s the fact that streaming doesn’t make a whole lot of revenue to begin with. The most likely way for that to change is for there to be more paying users in the system. So if the golden age of simplicity for streaming’s early adopters is coming to an end, the health of the music industry might be worth it. What will it take to get more users to pay for streaming services? There are people dropping close to $1000 at Coachella…I’m struggling to believe that the price of streaming really the problem. Maybe it’s just the experience? Perhaps people do want to support artists, who often get paid a lot more doing shows than making albums. Paying Spotify / Pandora just feels distant…like paying for the convenience of using a big machine. Drake pulled a Beyoncé last night and dropped a surprise mixtape, but the guy tweeted it right before midnight. Who does that?(!?!) Normal people have to sleep on Thursday nights, Drake. You almost made us miss history. Somewhere somebody must have some sense. Men must see that force begets force, hate begets hate, toughness begets toughness. And it is all a descending spiral, ultimately ending in destruction for all and everybody. Somebody must have sense enough and morality enough to cut off the chain of hate and the chain of evil in the universe. And you do that by love. In honor of MLK Day 2015, today’s Case of the Mondays post features four songs that were written and performed in honor of Martin Luther King, Jr. Some of these were written to advocate for establishing MLK Day as a national holiday, and provide yet another example of how music continues to influence and create our history. Stevie Wonder was very involved in the fight for making MLK Day as a national holiday. “Happy Birthday” was a popular song he used to garner support for his campaign. The song was released in 1981, and Reagan signed the holiday into existence in 1983. This song was written by Public Enemy’s Chuck D as a direct reply to Arizona officials, including John McCain and Fife Symington, for rejecting the federal holiday celebrating Martin Luther King Jr. Recorded on April 7, 1968, live three days after the death of Martin Luther King, Jr. and performed at the Westbury Music Fair. Nina Simone dedicated her performance to King’s memory. And I would be remiss if I did not send a Happy belated birthday to Aaliyah, who would have turned 36 this year. Frank Ocean posted an incredible cover of her song “At Your Best” (originally by the Isley Brother’s) on Saturday. Check it out on his tumblr. If you’re not from Cuba and weren’t alive in the ‘50s, this question could have some validity to it. And it’s one my brother asked when I told him I was writing this post. Since President Obama’s announcement that the US will look to strengthen its diplomatic relations with Cuba, countless articles have been written speculating about the impact this will have on Cuba’s economy. Americans can now bring back up to $100 in Cuban cigars, investors are rushing to gather real estate, and collectors are getting set to bid on artwork that they see as undervalued. But you have to wonder how Cuba’s music fits into all of this. 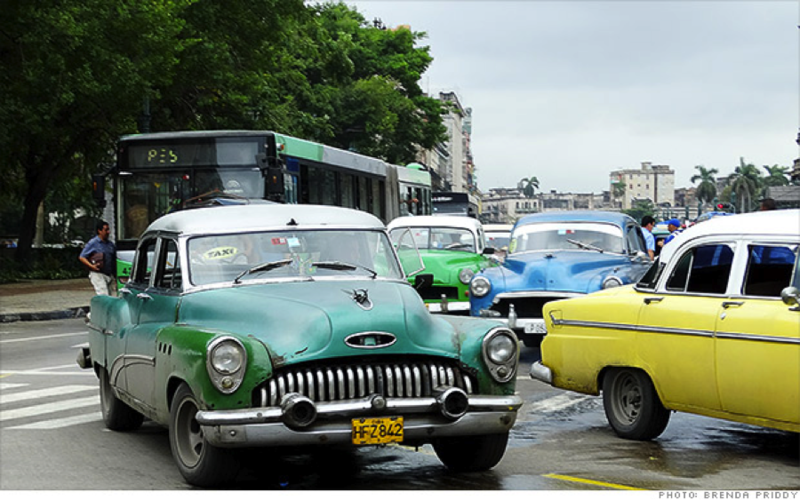 Search Cuba’s cars on the internet and you’ll feel like you’ve entered a time-warp that, in truth, summarizes how a 50-year embargo has put this country’s economic advancement on hold. Arguably however, music hasn’t faltered as much — unlike cars and buildings, which are physical objects that can be embargoed — music, and other cultural ‘necessities’ have continued to be exported. In America alone, we’ve had several music pioneers of Cuban descent such as Gloria Estefan, Celia Cruz, and Tito Puente (and even Pitbull). But one could also argue that most of the ‘influential’ Cuban American music artists were witnessed during the ‘50s mambo craze, or before the embargo was implemented – a time that many find hard to recall now. So why should you care about Cuban music? 2. 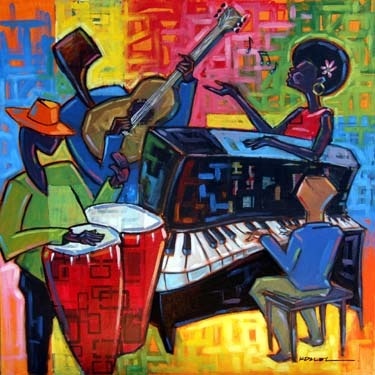 Son was the most popular Cuban music and dance genre of the 20th century. The earliest surviving Cuban son (son de la Ma Teodora) was created in the 1570s. 3. Sugar plantation owners imported nearly 20,000 slaves to Cuba in the 1780s, strengthening African-derived religious practices on the island, namely santería and palo. And an interesting fact about Santería: slaves were forbidden to practice non-Christian religions in Cuba, but did so secretly by worshipping Catholic saints in form only, understanding them to be disguises underneath which existed their traditional African deities. Santería was very influential in Cuban music due to its drumming practices. 7. 1945: mambo appears in the United States. The word “mambo” means “conversation with the gods” in Kikongo, the language spoken by Central African slaves taken to Cuba. The Cha-cha-cha, a kind of mambo created by Cuban violinist Enrique Jorrin later swept through NYC in 1954 and the rest of the world. Below is a scene from the 1992 film Mambo Kings, a story about two brothers and aspiring musicians who flee from Cuba to America in the hopes of reviving their failed musical careers. 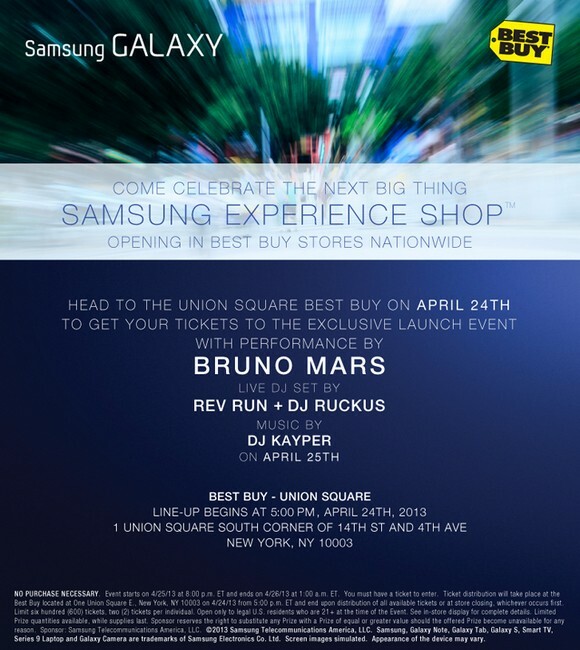 Hosted by Samsung, Bruno Mars will perform tomorrow, the 25th, followed by a DJ set from Rev Run and DJ Ruckus. To get tickets to the performance head over to Best Buy – Union Square today at 5 pm. Everything’s free…open bar + food + performances. What more could you ask for? See the flyer for more info. Rumor has it that Macklemore will most likely not be attending Bachannal, Columbia’s spring concert. Can anyone be surprised though? CU is known for bringing in has-been’s (i.e. Snoop Dogg) or will-be’s (Wiz Khalifa), so pulling off Macklemore would have been one for the books. For now, we should probably start thinking of some other options. ASAP Rocky, Meek Millz, Kendrick Lamar, etc. are already being suggested on Bwog’s comments. While we’re reaching for the stars, maybe someone should take the subway/Metro North to one Beyonce’s places and ask her (kidding, kind of).